Brilliant concepts, modern designs and well-planned solutions are the hallmarks of Liebherr’s range of domestic appliances. The German manufacturer produces table-top, free-standing and combined refrigerators and freezers, freezer chests, food storage and drink cooling refrigerators, wine cooling and wine-temperature control cabinets. 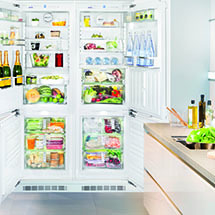 Liebherr’s BioFresh appliances offer state-of-the-art refrigeration technology combined with perfect design – ideal for health-conscious food lovers. With BioFresh, fruit and vegetables, meat, fish and dairy products retain their healthy vitamins, delicate aroma and appetising appearance much longer than in a conventional fridge compartment.